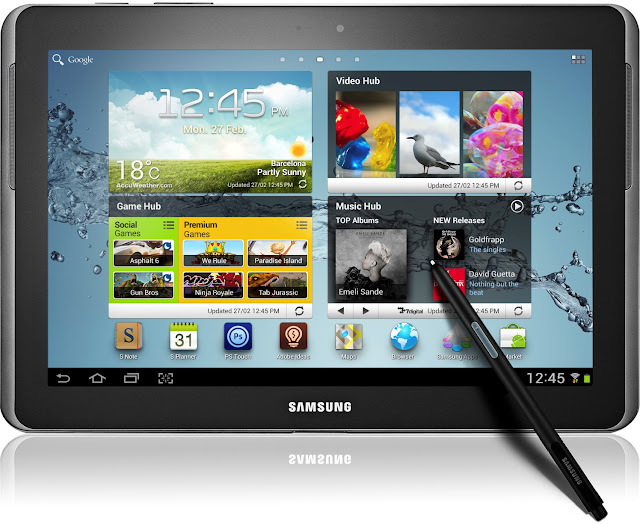 Galaxy Note 10.1 Tablet features 10.1-inch PLS TFT capacitive touchscreen display with 800 x 1280pixel resolutions. It is powered by 1.4 GHz Quad-core processor with 2GB RAM and has Mali-400 GPU. The Galaxy Note 10.1 runs on Android Ice Cream Sandwich v4.0.3 OS (Jelly Bean update later)with Samsung TouchWiz UI. It comes in 16/32/64 GB of storage with up to 64GB Via. microSD card option. Galaxy Note 10.1 sports 5MP rear camera with autofocus, LED flash and has 1.9MP front-facing web camera. It has a dimension of 262 x 180 x 8.9mm and weighs 600gms. Connectivity options includes 3G, Wi-Fi 802.11 a/b/g/n, Wi-Fi Direct, dual-band, Wi-Fi hotspot, Bluetooth v4.0 with A2DP, microUSB v2.0, GPS with A-GPS support. Sensor options includes Accelerometer, Gyro and compass. Other features includes a stylus(S Pen), ability to view two apps at once in a split-screen view, several apps that allow you to use it for note-taking, plastic case with a thin, silvery border, twin front-mounted speakers and a storage slot for the stylus. Galaxy Note 10.1 has a standard Li-Ion 7000mAh battery which claims a back up of upto 7Hrs 30 minutes. Black and Silver are the Color Options availabile. Galaxy Note 10.1 comes with a price tag of $499.99 USD for a 16GB, $550 for 32GB. Tags: Galaxy Note 10.1, Galaxy Note 10.1 features, Galaxy Note 10.1 specifications, Galaxy Note 10.1 review, Galaxy Note 10.1 details, Galaxy Note 10.1 availability, Galaxy Note 10.1 specs, Galaxy Note 10.1 images, Galaxy Note 10.1 pics, Galaxy Note 10.1 pictures, Galaxy Note 10.1 price.